BEAR, Del. 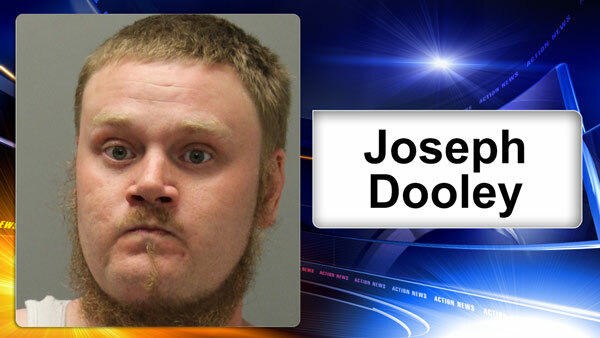 (WPVI) -- Delaware State Police have arrested a man after they say he impersonated a New Castle County police officer. It happened around 8:15 p.m. last Thursday near the Seasons Pizza on the 1400 block of Pulaski Highway in Bear. Police say a customer parked her car adjacent to the pizza shop. As the woman entered the restaurant, police say she was confronted by a man, later identified as Joseph Dooley, 30, of Bear. Dooley allegedly ordered the customer to move her car and then called her a racial slur. As the woman left the restaurant, police say she was followed by Dooley who then began to take a picture of her vehicle's license plate. He then allegedly told the victim that he was an officer with the New Castle County Police Department. The customer then began recording Dooley and was able to obtain the license plate number of his vehicle before he fled the parking lot. Troopers arrived to Dooley's home and took him into custody without incident. He was charged with Criminal Impersonation of a Police Officer and Terroristic Threatening. He was arraigned and committed to the Howard Young Correctional Institution in default of $3,500 cash bail.